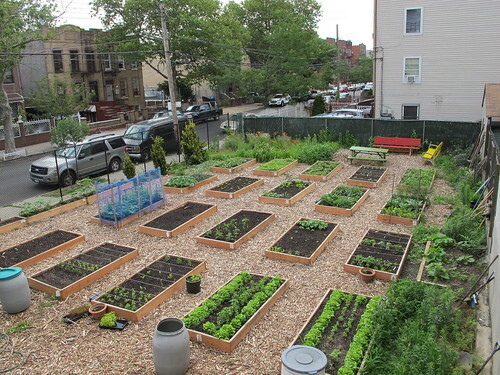 GrowNYC is proud to announce that we have completed our 100th community garden -- Jackson Forest Community Garden! The Jackson Forest site has been home to a garden since 1983. After a building was demolished, the lot was an eyesore – it was a mess and full of trash. 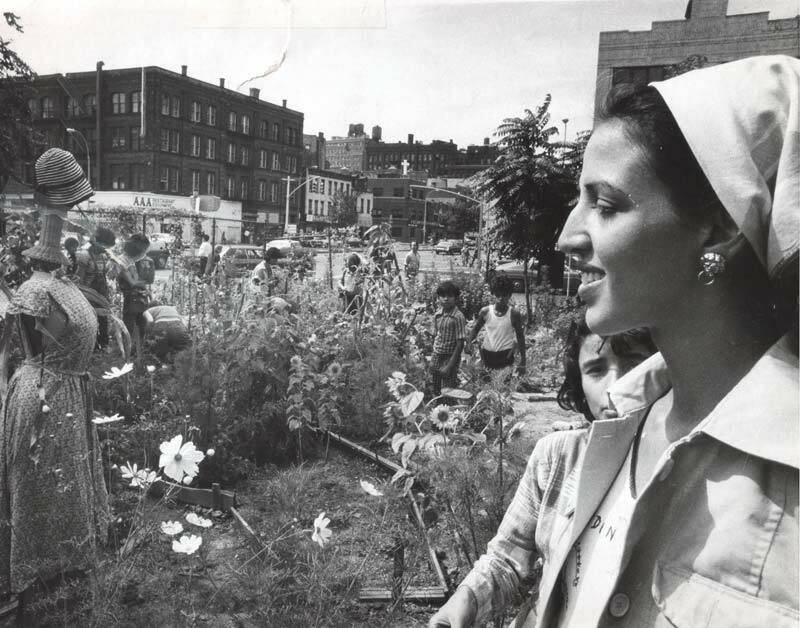 The community cleared out the lot and began planting, and the site became a GreenThumb garden in 1991. It flourished – it was full of trees, flowers, fruits, vegetables, and herbs. A true community space, gardeners at Jackson Forest would often leave extra produce near the entrance so neighbors walking by could grab fresh vegetables. In 2008, the garden closed to build a new retaining wall and an iron fence and install a permanent water source. The garden had to be demolished in the process, and the renovations ended up taking longer than expected, while the anxious gardeners had no access to the site. 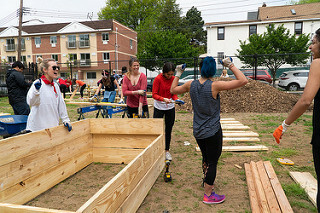 Jackson Forest Community Garden was recently rebuilt by the GrowNYC Gardens team, along with help from corporate volunteers from BrainPOP, Morgan Stanley, and KPS Advisors. It was a lot of hard work! 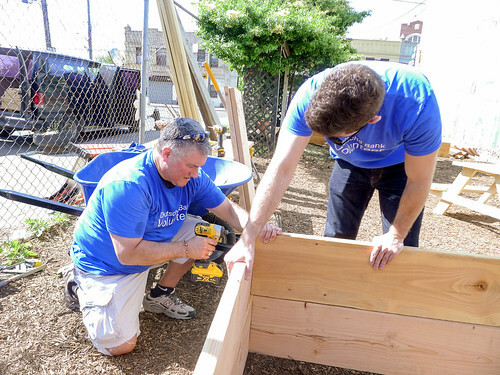 They mulched, raked, spread soil, and built new garden beds, tables, and benches for community members to enjoy. The gardeners have been working on getting the garden back up and running and so far have grown cucumbers, okra, peaches, and lots of tomatoes! Students from the nearby school come to take care of their two beds and learn about the science of gardening and composting. Next spring, the gardeners plan to throw a big opening party to welcome the neighborhood back to the garden. In the future, the gardeners hope that Jackson Forest will again be a community meeting space, to offer fresh produce to the neighbors, and to teach classes for children on weekends. 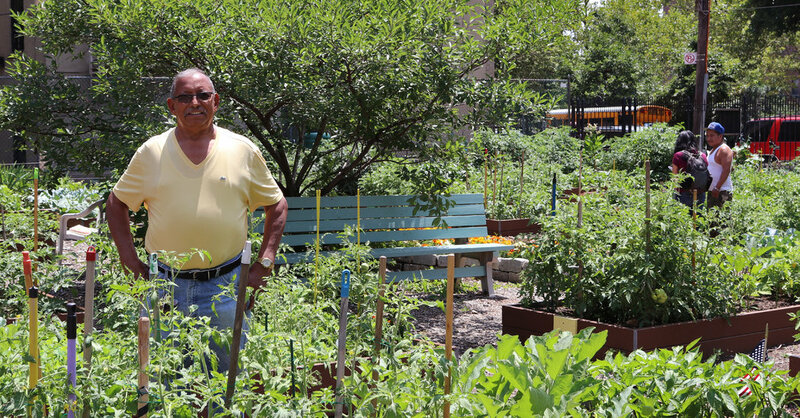 GrowNYC is so honored to call the Jackson Forest Community Garden our 100th garden. The dedicated spirit and joy of the community gardeners at Jackson Forest are a shining example of how important places like this are for a neighborhood. Today, this garden’s beauty shows what can be accomplished when we work together! You can be proud knowing that all the achievements of our Gardens program were made possible with support from people like you. We never would have been able to do it without help from our many donors, especially the Louis and Anne Abrons Foundation. Since September, you helped to raise $41,592 for the New Garden Fund. That’s $11,592 over our goal! You’ve helped establish the foundation for our Gardens program to continue building the NEXT 100 gardens that serve communities like yours all around the city. Thank you so much to everyone who believed in our vision and helped contribute! We couldn’t do it without you! Want to stay involved? Visit our website to learn more about our Gardens program, find a community garden near you, receive our community gardens newsletter, or sign up to volunteer! As part of our end of the year review, we caught up with Mike Rezny, Assistant Director of Open Space Greening at GrowNYC, to talk about the year in urban agriculture, all the new gardens we built, and what's on tap for 2017. For those that don't know, what does GrowNYC's Open Space Greening program do? 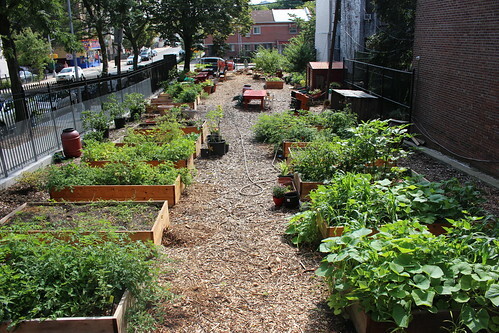 Open Space Greening builds and supports community gardens, urban farms, and school gardens all across New York City. That includes building farms and Green Thumb gardens on city-owned land, gardens in public housing developments, gardens at NYC public schools, and, one time, a garden at JetBlue's terminal at JFK. Most commonly, that means we're working with Green Thumb to identify a vacant lot and working with them and community members to organize a group to steward the space, designing a garden, building garden beds, seating, shade structures, and anything else a garden needs, and turning it over to that neighborhood group who will make their garden into a community hub for growing healthy food, for neighbors to meet one another, and for running public events. What were some highlights in 2016? We definitely had a busy year! We built eight new farms and gardens, creating more than 54,000 square feet of new green space in New York City. We also renovated more than 20 additional gardens, built 11 rainwater harvesting systems that collect more than 100,000 gallons of water every year, and had our 3rd successful year of our farm on Governors Island where we ran 9 school tours a week from March to November and worked with more than 5,000 NYC schoolchildren. What was your favorite garden project of the year? 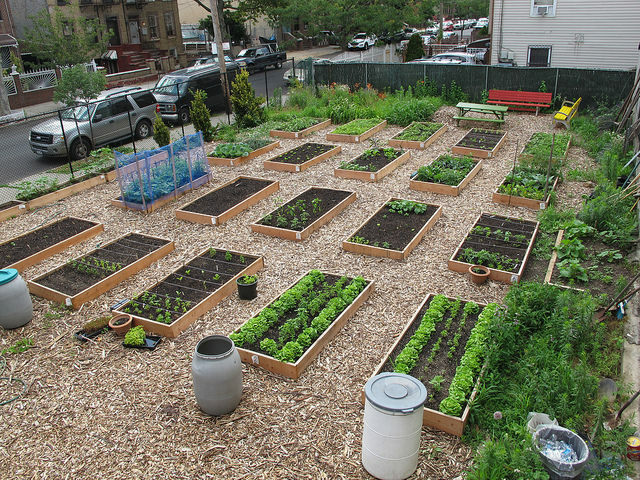 Hard to choose, but it's got to be the 2 new gardens we built in the South Bronx, United We Stand and 138th Street Community Garden. Note: These gardens were featured in a 2017 New York Times article. 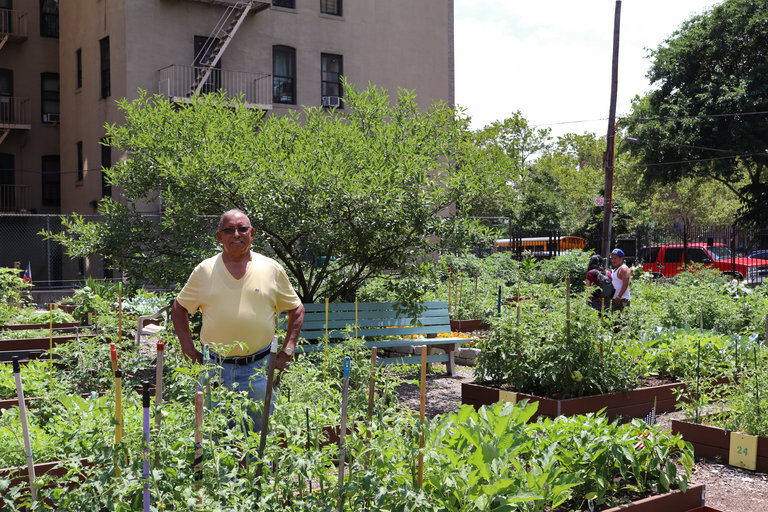 For about 25 years, 4 contiguous gardens thrived on 137th and 138th Street in Mott Haven. They had hundreds of members, grew an enormous amount of food, and were some of the best known gardens in the city. Then, in the winter of 2014/2015, a fire broke out in one garden, spread to the other gardens, and decimated all 4 spaces. Casitas, garden beds, picnic tables, fruit trees -- all ruined. The gardens were closed for an entire year and everyone that used to enjoy the gardens was really devastated. Green Thumb flagged the project for us in February of 2016, and shortly thereafter we took funders and some city agency partners on tours of the space. We started work in April, our first volunteer groups came in May and we wrapped up construction with a garden opening in September. 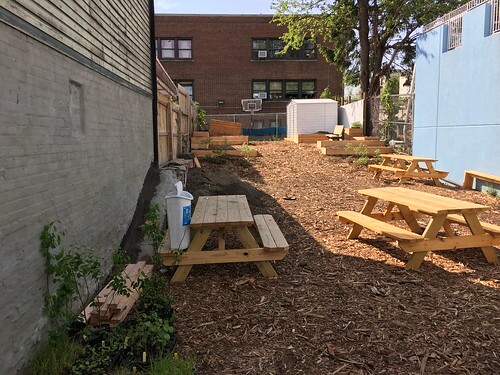 So many city agencies helped out - Department of Sanitation cleared the space, the Mayor's Office of Environmental Remediation's Clean Soil Bank brought in 300 cubic yards of fill, and we worked with NYC Parks to run a dozen community design charettes. The garden has been an unbelievable success. 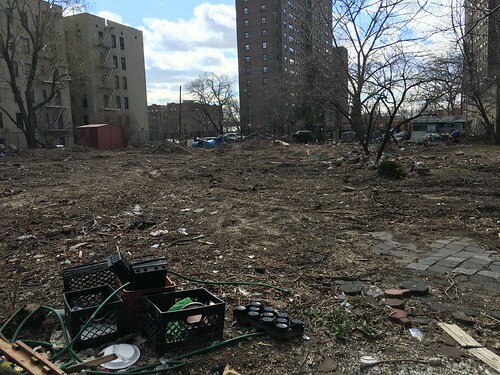 Where there were once 4 separate gardens all separated by fences, there is now 1 big space connecting 137th Street to 138th Street in the middle of the block. There are hundreds of garden members, 80 garden beds growing a ton of food, a huge performance stage, and so many happy people. We built one garden with New York City Housing Authority in 2016 and we see lots of great opportunities to build more gardens in public housing in the future. There is so much green space around public housing buildings that is just dying to be used. One unique thing about community gardens is that they give residents the opportunity to design a public space in their own image, to organize how it is managed, and to use the space on their own terms. The best gardens are extremely reflective of the neighborhoods in which they exist, with young and old people working alongside each other to do something for the entire community to enjoy. What kind of support could you use in 2017? Volunteers have been a huge part of what's made our garden program so efficient in recent years: of the 94 gardens we've built since 1975, 31 have been built in the last 4 years, and a lot of that is thanks to volunteers. We worked with more than 2700 in 2016 and we can always use more. 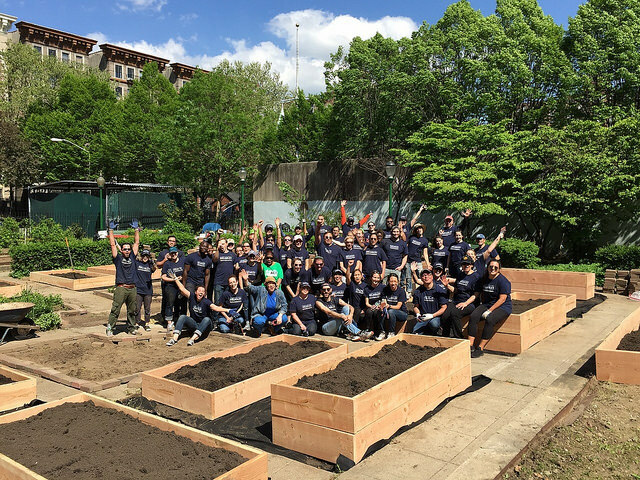 The United We Stand and 138th Street Community Garden projects couldn't have been completed without generous funding from companies like Timberland, Heineken, and Samsung, all of whom funded our work and brought hundreds of employees out for volunteer days. If your company is interested in coming out to volunteer, let us know! 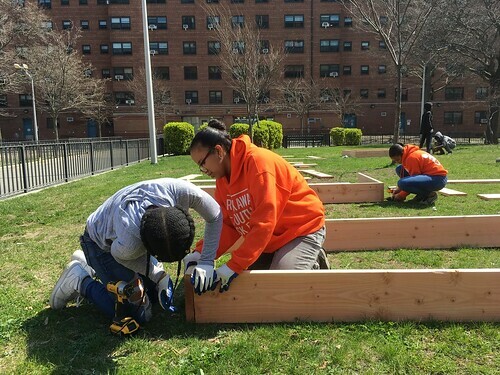 GrowNYC Builds 7 new gardens in 2015! 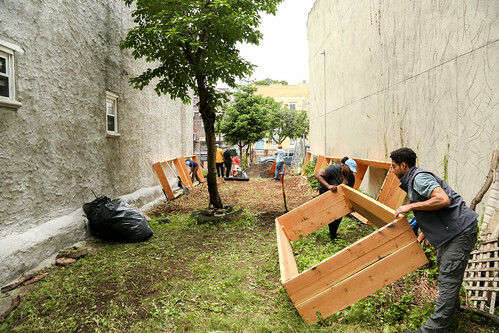 GrowNYC's garden program had an eventul 2015, full of new gardens, rejuvenations of existing spaces, and several innovative garden projects that help make New York a greener city. 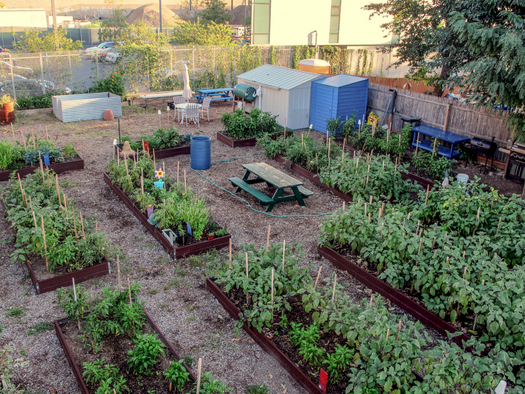 Additionally, our garden program did major rejuvenation projects on 7 community gardens and 1 school gardens, totaling 72,000 square feet of existing green space that was transformed. All of this work is done alongside great partners, including GreenThumb, 596 Acres, Brooklyn Botanic Garden, Brooklyn Queens Land Trust, FDNY, and New York Botanical Garden's Bronx Green Up. 10 new rainwater harvesting systems, in Crotona Park East (BX) East Harlem (MN), Governors Island, Greenpoint (BK), Mott Haven (BX), and Park Slope (BK). 1 new bioswale, in East Harlem. A new aquaponic shipping container at an urban farm in Far Rockaway. GrowNYC completed our second year of programming at Governors Island Teaching Garden, an urban farm that provides free educational programming for public schools students and summer camp groups from March to November, as well as holds open hours for the general public on weekends during the general Governors Island open season. We made some great additions to our farm space in 2015, including a high tunnel greenhouse, a solar oven, a rain garden, and several rainwater harvesting systems. Interacting with more than 5,000 visitors from the general public during weekend open hours. This fall, GrowNYC helped build T5 Farm at JetBlue's Terminal 5 at JFK Airport. The 24,000 square foot farm features more than 4,000 recycled milk crates growing blue potatoes - the same variety that TERRA gives away on JetBlue flights - as well as other herbs and vegetables. 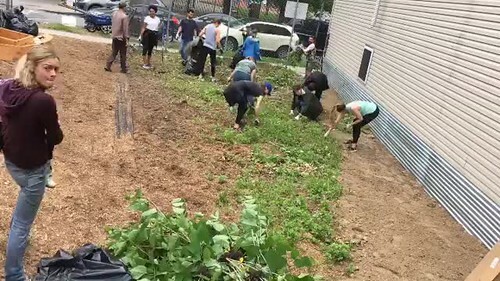 T5 Farm was created in collaboration with GrowNYC Partners, a consultancy arm of GrowNYC that returns profits to the mission-based activities of GrowNYC - like the 7 new gardens we built this year. We also continued our efforts to bring community gardening to affordable housing developments. 2015 marked our fourth year of working at Via Verde, where a 5,000 square foot rooftop garden is enjoyed by the building's residents. GrowNYC also ran seasonal workshops about gardening, healthy eating, and much more. In Long Island City, GrowNYC helped to design a 2,300 square foot rooftop farm on top of Queens' newest affordable housing complex, Hunter's Point South. The farm features 13 oversized raised beds and a beehive, and will also host a GrowNYC-run Fresh Food Box for building residents. We'll be back working at T5 Farm, Via Verde, and Hunter's Point South in 2016, working to continue bringing innovative programming to each one. We can't wait! 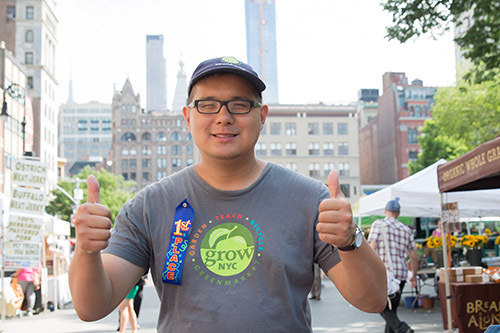 Read more about GrowNYC Builds 7 new gardens in 2015!